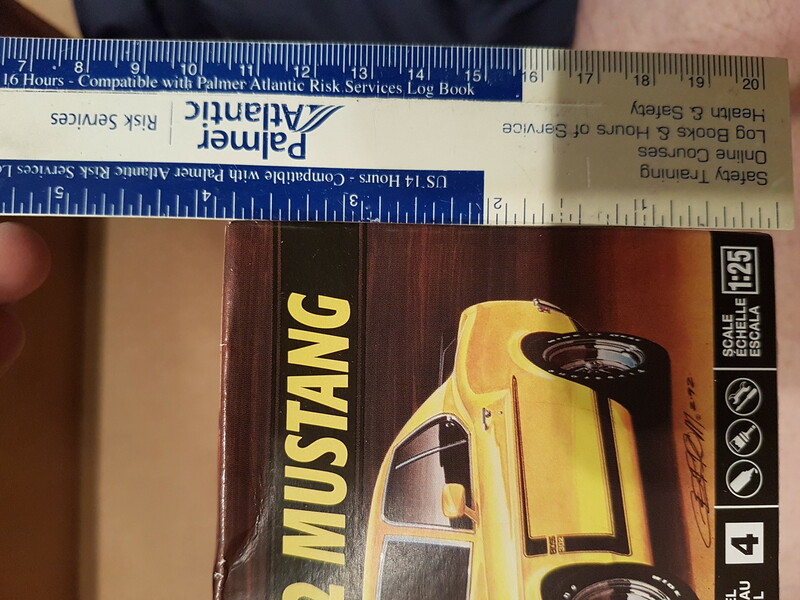 The funny part is: reading remarks from people with poor-to-nonexistent modeling skills picking apart PICTURES of model car kits ( were they ever advertised as miniature replicas? ) that are blown up to 3-5 times their actual size ( hey, i have a 48" monitor, and you don't ) and implying that they have the talent to finish such a 'defective model' to the point where the only apparent defects that are visible in the finished product are the ones that were there when it fell out of the mold. In other words, we have a book of criticisms from people whose skills fail to rise to the perfection that they demand. Gotta be the same crop of complainers who congregate at the local coffee shop every morning. If this model was 100% accurate, folks here would argue that the manufacturer packaged the kit using cardboard stock that was slightly thinner/thicker than that used on all the old vintage kits form the good ol' days. It's OK to disagree, but keep it civil. Don't make it personal. In case you were wondering the 70 Mach1 interior WILL fit in the 69 Boss with just a little trimming. I will go that route instead of butchering the kit just to take out the roll bar mounts. As a Mustang purist I'd wince at that since I see way too many "real" Mach1 and Boss convertibles already. Thanks Bill (Mr. Obsessive), for taking the time to give us the pics and general rundown of this kit. Definitely on the to get list. Recently acquired this kit and did some tweaking to the nose and glued it in place. I removed material to allow the nose to be installed high enough that the body line (on the nose) aligned with that of the body. Also flattened out the top a bit. Not perfect but an improvement I think. I ordered this and the Chevelle when they released and finally was able to pick them up today. 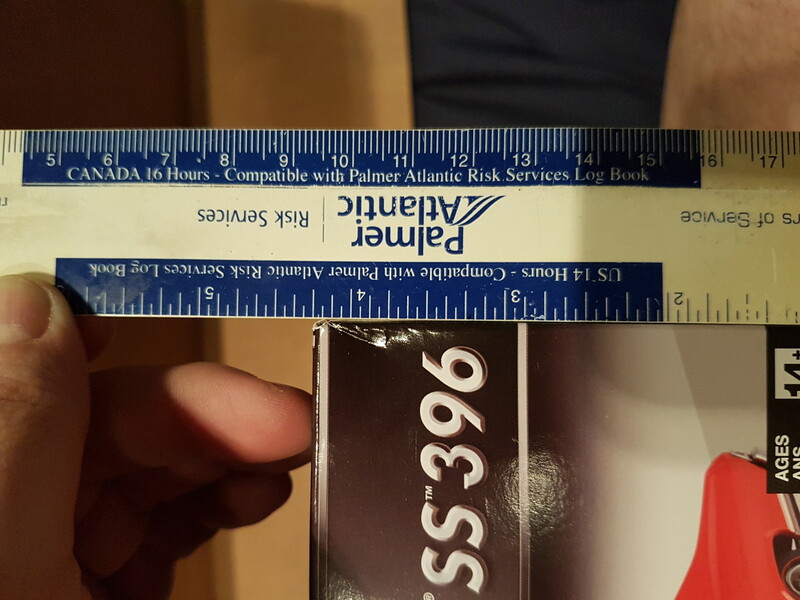 All this talk and no one has mentioned that the kit box is Round 2 sized instead of the traditional Revell box size. Might not mean much to most, but the way I store my stash I've always been able to stack two Revell boxes or three Round 2 boxes per shelf. Perhaps the new Revell is changing their shipping methods? Interesting. Never noticed the difference in box sizes between Round 2 and Revell. Comparing a couple kits, recent Revell boxes seem to a bit taller than Round 2 boxes, same length and width though. I do seem to be able to stack 4 Round 2 boxes in the same shelf space I can fit 3 Revell boxes. Completed build (w/o engine) by Al Meske. Two things jump out at me which I think others already mentioned. The area where the emblem goes (on the Mach1) behind the rear window needs to be smoothed out since the Boss does not have them. Also, as JC recently noted, the nose should be tweaked to make sure it aligns with the fender. Hats off to Al for painting his Boss in the least seen color of the four. No you have not been drinking but who can explain these pictures? No you have been drinking but who can explain these pictures? Test shot pics, maybe? The front bumper isn't chromed. 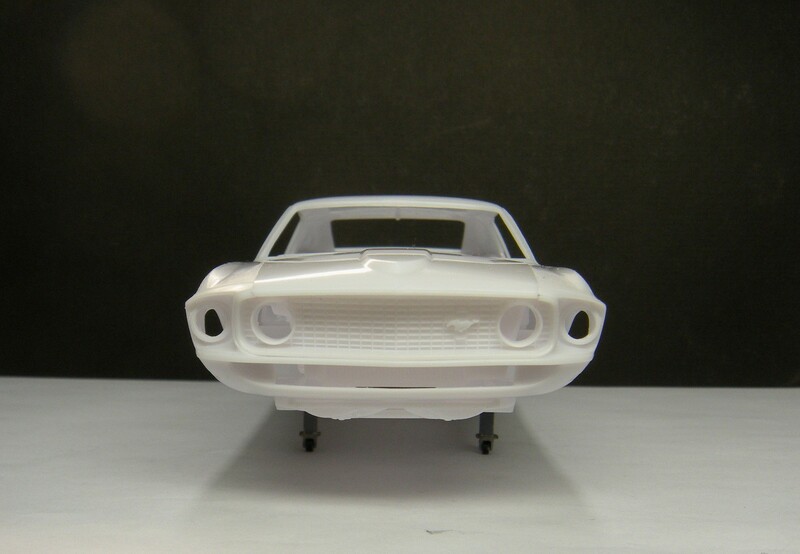 Hmm...I have the Monogram 1/32nd '70 Mach 1 and Mini Exacts 1/87th '69 Mustang...but this looks like is a '69 Boss 302. It will be a street Boss 302. Now I just need to find 1/32 Magnum 500s and Boss decals. Stopped for the day; turns out the old log book ruler is still useful for something. I don't have any Round 2 boxes in the truck with my right now to compare with. But I think Rob was right, it is actually four short boxes for 3 tall ones. 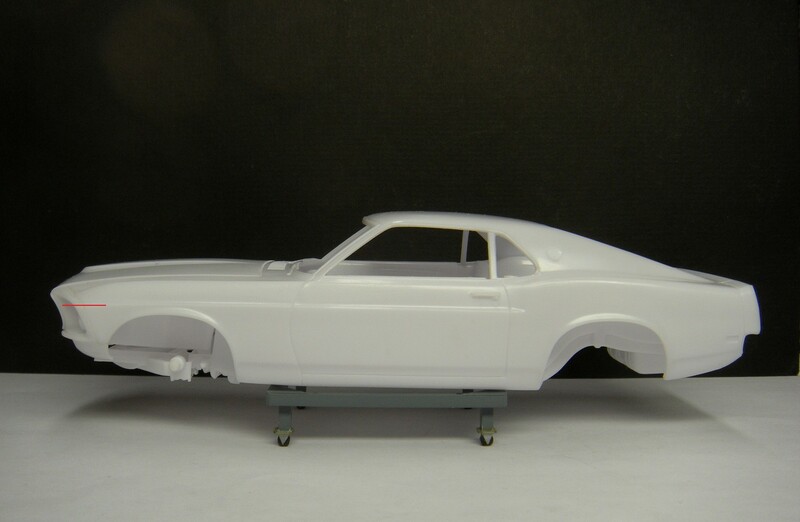 So question, were the available '69 Mustang kits just a early release ahead of the main one or was it a supremely small stock? I had to chalk off 40$ international shipping on top of the kit price so I thought hell no at the time but as of late I cant even spot a single one on eBay(or rather one that can be shipped internationally). Well, this was the US release...I don't know if Revell has released it internationally yet. I've just got to get one for my collection. 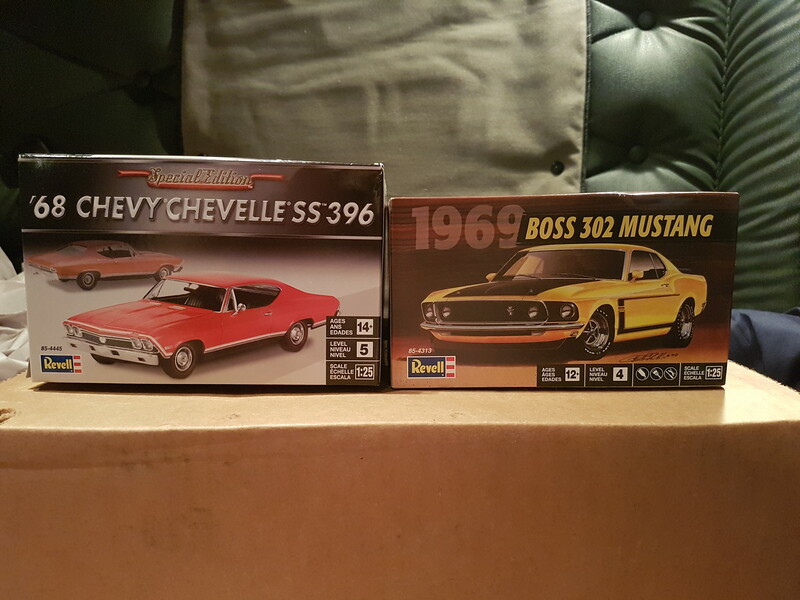 Looking at the box art, I think I'll model the Boss 302 with the front wheels turned as is pictured. The real car was built to boogie around corners , so the turned wheels add to it's credentials. Thanks for the review, Bill. The nose looks good enough now that I'll make the effort to correct the other obvious flaws...at least to the point where they're not SO obvious. Courious? If a resin corrected interior tub was available. How many of you would buy one @ $15 a tub?